The 50m Rifle reduced for 50yd. Target, commonly called the "50yd. Rifle Target," is avaliable in two options. Orion's Mobile Phone application supports photographing both options for scoring. 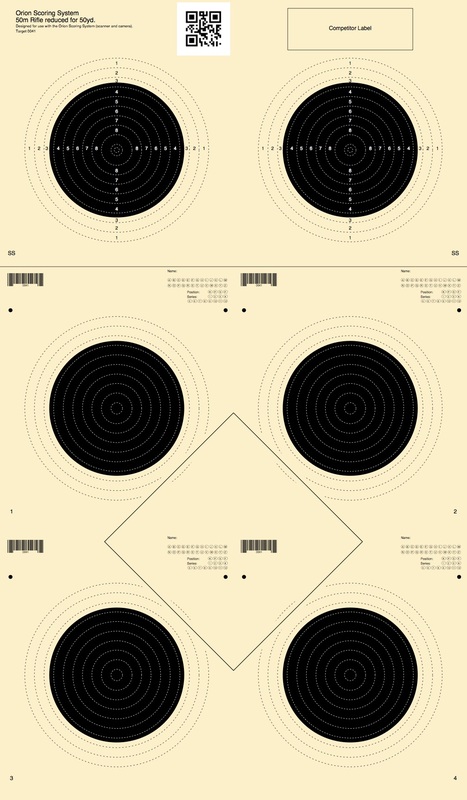 The first option, Scanner or Camera Image Acquisition uses Orion's heavy target paper and is perforated into individual aiming bulls that may be scanned for scoring using any supported scanner. The paper however must be protected from rain and wind, as either may damage the paper. The second option Camera Only Image Acquisition uses a weatherproof paper and is not perforated, and thus does not support scanning. This option however may be used in rain and windy conditions. Outdoor use but must be protected from rain and wind. Outdoor use and may be used in rain and wind.